Husband (did I mention Boyfriend has been upgraded?) 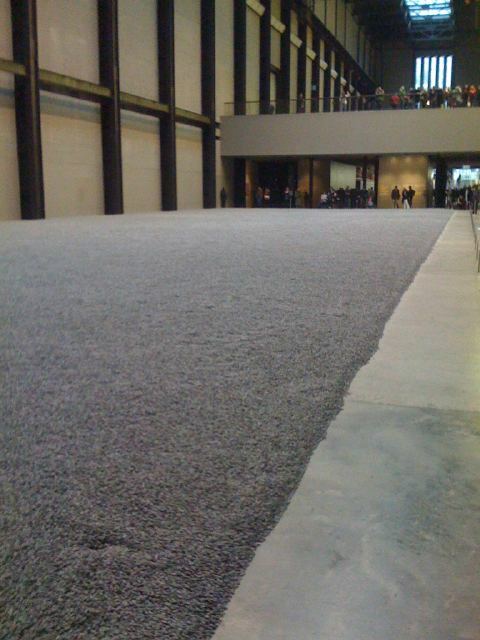 wanted to see Ai Weiwei’s Sunflower Seed exhibit at the Tate Modern. This was an easy sell for me. I am a sucker for modern art museums. Unilever has commissioned Ai Weiwei’s brainchild: 100 million hand crafted porcelain sunflower seeds displayed in the Turbine Hall. The colors of the concrete floor blend with the small porcelain seeds like a slight ripple in the floor’s texture continuity. As you approach you notice the individual pieces making up the whole until you eventually realize the small tiny pieces are sunflower seeds. At this point you want to pick one up and bite one, but the sunflower seeds are not real and the exhibit has been deemed non interactive for safety reasons. The dust from the porcelain is easily kicked up and can enter the lungs. A fifteen minute video shows how these pieces were handcrafted in Jingdezhen, China. You get a glimpse into the lives of the 1600 people and two and a half years that the manufacturing took place. The people are grateful for the work but I’m curious to whether they find value in the project beyond a paycheck. And perhaps that’s the point – to make me consider the “Made in China” label. Or maybe it’s a statement on how all these small pieces can make up a whole. How collectively we become something we could never be as an individual. The political weaves it’s way in and out of the display. There is mention of how the sunflower seed was once a symbol of goodwill between neighbors but was adopted and altered into kitsch and propaganda by Mao Zedong during the Cultural Revolution. Seems like a lot to say all at once. “Did I get it all?” I asked Husband. He is standing on the bridge above the sunflower seeds looking down with awe that I haven’t seemed to muster. Maybe I’m not suppose to be so worried about whether or not I got it right.